At their best, Rough Guide volumes present a balanced consideration of facts and criticism. But under the ostensibly authoritative brand name, they assume the reader’s implicit trust in a single author covering a given genre. In the case of Peter Shapiro (who also penned guides to Disco and Drum ’n’ Bass) this seems a safe bet. 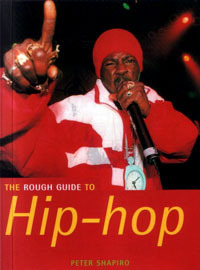 Throughout the book he demonstrates a voluminous knowledge of hip-hop history and culture, peppering artist entries with sidebars on everything from mix-tape trading to wild-style graffiti. However, there’s a heavy feeling of “one man’s opinion” pervading the book. As a result, the reader most likely to thoroughly enjoy it is Mr. Shapiro himself. That’s not to say there isn’t much to admire here, as he gives props to everyone from old-school masters like Public Enemy to fringe artists like Three 6 Mafia, but one is advised to read with open eyes and ears.